My parents were Depression Era babies and they both grew up knowing the value of saving. Saving money, saving string, saving magazines from 1950, saving everything because “someday you may need it.” This was a valuable approach in the Depression of the 1930’s and in some ways it has become useful again today. Except we have so much more stuff these days. I learned the “keep it in case you need it” approach myself and over time I had accumulated way too much “stuff”. Memorabilia. Gifts people had given me I was reluctant to part with even if they had long been forgotten. Silly gift my parents had given me (we are a family of givers!). Old clothes that no longer fit or never fit my right. I am not a hoarder by any means. But I did have way too much stuff. All that stuff wasn’t hurting me directly, but I did feel the weight of it and felt stress of having too much stuff for my living space. I went though my closets and drawers and found that about 70% of the stuff I was holding onto were things I no longer needed, used or even knew I had. Instead of out-and-out throwing it all away, which felt a bit wasteful to me, I either regifted things or donated them to charitable organizations that resell or give away items. If you are a clutterer, or feel stressed by your ‘stuff, you may want to read the book and see if any of the ideas presented appeal to you. You don’t have to believe in Fung Shui to get sue out of the book. The tips she presents and ideas are simple and practical. Another book that has been useful to many of my friends, is “Getting Things Done: The Art of Stress-Free Productivity .” However, I found that book more difficult to read and follow. I tried the author, David Allen’s suggested approach of creating 31 file folders to put things in that needed to be done each day. It didn’t work for me, but it may for others. But David does offer other tips that may be useful. 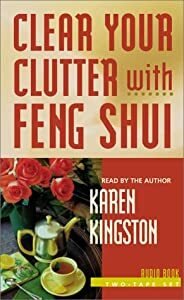 For me, the Fung Shui book was an easier read with more practical tips. But read both and use tips that work for you from both books or either book. And if you feel your cluttering is out of hand, and you may be a hoarder, then check out the show, Hoarders, on A&E. the show shows people who are trying to get a handle on their hoarding habits. Note: As of this month, I began participating in Amazon’s Affiliate program. So if you purchase a product via links in this post, my blog gets a tiny percentage of the sale (Literally a few pennies). I’ve been recommending products via Amazon (which usually has the lowest prices and best selection) anyway, so I am recouping blog costs via these links. If you don’t want to kick me a few pennies, no worries. Just look up the books yourself on Amazon!